In the book The Power Of Habit, by Charles Duhigg, he talks about how powerful habits are, and how difficult it is to remove one. In fact, he puts forward the idea that actually, you can’t remove a habit at all, but you can replace a bad habit with a good one. Great, I hear you think, but what does this have to do with my coaching business? Well, I believe it has a lot to do with it. In fact, I have a theory that it is everything to do with it. I’ve Got A Website, Where Are My Clients? Fact: having a coaching qualification on its own, equips you with 50% of the skills you need in order to have a successful coaching business, with paying clients. Fact: the other 50% of the skills required are business developments skills; marketing and sales. Fact: many (most?) coaches do not have those business development skills. Fact: the business development skills you need are simple and can, like any other skill, be learned. What’s This Got To Do With Habits? Once our Coaching Revolution mentees learn our system, they need to implement it consistently. Consistent implementation is about showing up, regularly – every day in fact. Doing this is about developing habits that are good for your coaching business. These are usually new habits as most of our mentees had little idea about business development before they joined us, or they’d tried lots of thing and discovered that these either worked intermittently, or not at all. One of the things that Duhigg talks about in his book, is that the good ‘process’ alone isn’t enough to ingrain that process into a habit and that the real power of change comes from habits that are supported by groups who share a particular belief. The most famous example Duhigg gives is of Alcoholics Anonymous, and the 12-step process that people with a drink problem can use to become sober. Duhigg notes that understanding and implementing the process on its own is not enough for someone to become sober. The additional requirement is the belief that the goal of sobriety can be achieved. This belief is amplified and strengthened by the power of the groups that AA is so famous for. Let me put this another way; a proven process, the belief that it will work and the support of a group of likeminded individuals is key to success. I’m sure you’ve realised what I’m getting at here, but if you haven’t, let me help you. The Coaching Revolution has a simple and very effective business development processfor coaches. It is effective across continents and cultures. The Coaching Revolution members believe that our process works – unlike lots of other stuff that’s out there – because they see that it’s working for those of us who have been using our process for longer. Our belief is strong. The proof that we need to demonstrate that the process works includes The Coaching Revolution itself; we use our business development process to grow, as well as teaching it. 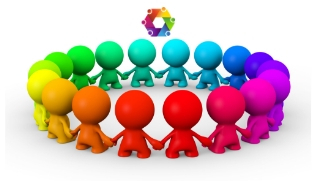 The Coaching Revolution is also a community, a group. It’s a group of likeminded individuals who can support us in our journey to success. To return to where I started, habits are important. The habits that we create, as part of The Coaching Revolution process are good ones. They are the habits that create consistent action, which in turn create a solid business. Want to talk about creating good habits? This is my diary. Commitment,is the biggest thing, with out you fall in a hole.